From the US and UK to Denmark and Ukraine, Just Jump is making its mark on the charts and is our pick for this week’s game spotlight. It’s currently ranked in the Top 100 free games category in over 70 different countries. Since its release this week, the game has been featured 296 times on the App Store homepage in markets across the globe. It was also recently featured in Apple’s ‘New Games We Love’ section in Canada. Just Jump was created by BB customer and CEO of Yabado, Florian Porkert and published by Ketchapp. 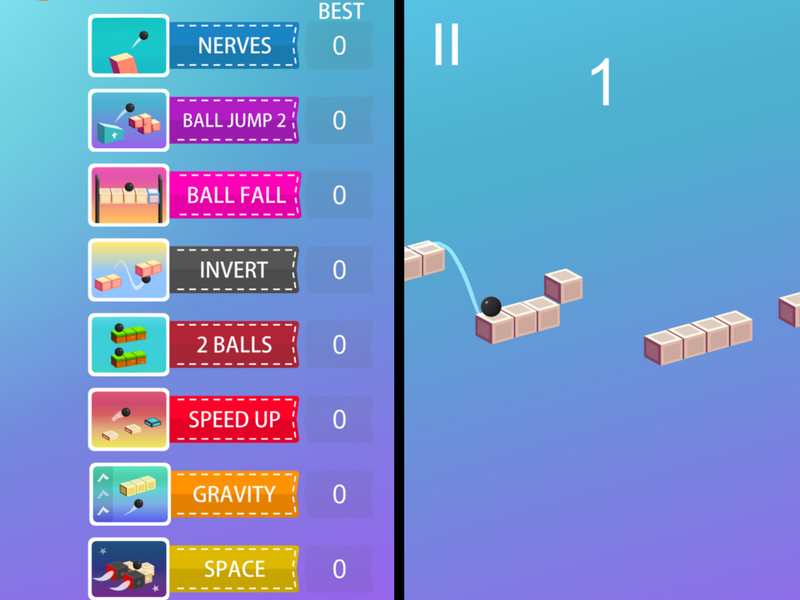 Porkert also created the 2015 hit game, Ball Jump, which was ranked #1 game in more than 30 different countries upon release. Just Jump includes the sequel to the hit along with seven other games all inside of one app. Just Jump is an action arcade game with a challenging twist. Instead of one single game with multiple levels or an endless style of gameplay, it features various games in one app. Players get to choose from 8 different games that play like spin-offs of the original hit, Ball Jump. In all of the games, the primary goal is to try to stay on the cubes without falling off while avoiding any incoming obstacles. However, it’s not that simple. Each game has its own set of challenges and exciting gameplay mechanics that come into play. Nerves is a fast-paced ride, where players attempt to guide their ball along a narrow platform as it moves, drops, and rotates. It definitely lives up to its name. Ball Jump 2 features high powered jumps and boost activated platforms that take the intensity up a notch. In Ball Fall players have to guide their ball on a downward path, tapping to smash through glass cubes while avoiding deadly spikes. Things get complicated in Invert. Timing and skills must be precise as players attempt to guide their ball on top and under moving cubed platforms. The challenge continues to pick up as players progress to 2 Balls guiding both balls through an ever-changing course. In Speed Up the cubes become less and it’s up to players to jump and keep up the pace. However, out of all the games, the two most challenging ones are Gravity and Space. In Gravity, players are jumping against a gravitational force that continuously changes as the speed of the moving cubes increase. In Space, a cubed rocket drops your ball off, and you’re now jumping in outer space with very little gravity testing your jumping skills in slow motion. What makes Just Jump fun is the ability to play any of the eight games whenever you want. You can skip from one game to the next trying to beat your latest score. There are also dozens of cool playable characters that you can unlock too. If you’re a fan of the original Ball Jump game or love a good challenge, Just Jump might be worth checking out. Just Jump is available for download on iOS. We love to see the games that our customers create like Just Jump top the charts. Congrats to Ketchapp, Florian Polkert and Yabado on their recent success. To learn more about the top games built with Buildbox, check out our All-Stars Showcase. RIP haha. Wait til a free plan comes out.